FOI Man reflects on the difficulties of being an FOI Officer. I don’t normally take requests (well, apart from those for information, of course). But one FOI Officer asked if I could write a post on the loneliness of being an FOI Officer, and it struck a chord. Now don’t all cry at once, the tears might damage your phone or digital interface of choice. I enjoy doing what I do very much, and the opportunities that have come my way because of FOI make it all worthwhile. But there is a serious point here. A few days ago I found myself talking to a group of colleagues. One of them joked that he had nothing to do because I’d not passed him any FOIs recently. He was, entirely good naturedly, having a slight dig at the pressure I put on his department to answer requests. But I couldn’t help dwelling on it a little – do people blame me personally for the extra work that an FOI request brings? Do they see me as disloyal because I fail to find a way to withhold information? Whose side am I on anyway? FOI Officers often find themselves in tricky situations. I’ve referred previously to a meeting on one occasion where the Mayor of London’s then Director of Communications once lightly suggested that if I couldn’t be more helpful, I and my team might find ourselves redundant. Wiser heads calmed the situation but I suspect I’m not the only FOI Officer to find themselves on the wrong side of an argument with the powers-that-be. Other FOI Officers I know have been persona non grata in parts of their organisation. And all for doing their jobs. But the reason it’s so difficult of course is because we’re also dealing with another unmoving force in the shape of requesters and the rights that the Act gives them. Requests have to be answered, and in a particular way, and that can be difficult to explain to colleagues. And when people don’t get the information they want, they can be pretty unpleasant about it at times – and the FOI Officer, who may well not agree with the decision themselves, is first in the line of fire. We get “named and shamed” by journalists. Pilloried in Tribunal decisions. Attacked by community groups. And again – all for doing our jobs. Many FOI Officers are at a very junior grade and are paid very little. It is often seen (wrongly) as a low-level administrative job. It’s hardly surprising that many of them start to turn against FOI after a few months or years of being stuck in the middle. But of course it’s not the Act’s fault. Research last year by UCL’s Constitution Unit found – not entirely surprisingly – that authorities where there is senior level support for FOI and transparency find it much easier to comply with the Act. Conversely, where politicians and senior officers are openly critical of it, compliance is very difficult. Talking to Dr Ben Worthy of the Unit earlier this year, he told me that there was also a relationship between support for FOI and the feelings of FOI Officers for the legislation. Again, not surprising. This is why I get so alarmed by the comments of current and former Prime Ministers and Cabinet Secretaries. Every time a senior figure speaks out against FOI, the jobs of FOI Officers get that little bit harder. If they enthused about it, our jobs would be much easier, and we could feel pride in our role as promoters of transparency, rather than, as occasionally, a twinge of shame. Many public bodies are very supportive of FOI Officers (and I include my own employer in that). But some aren’t. That needs to change. So to requesters out there, and journalists in particular, I say, give FOI Officers a break – we’re usually trying our best and often in the most trying of circumstances. 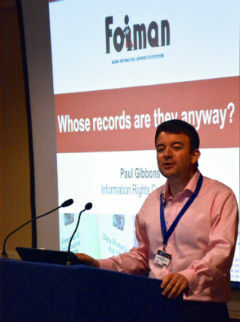 And to FOI Officers – as I’ve been telling delegates on my Practical FOI course recently – remember that you’re not alone. There are a lot of us who have been through similar experiences. 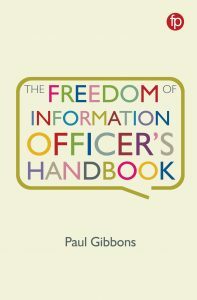 There are plenty of networks of FOI Officers online and in the physical world. Use them. Sometimes the answer, and a mind at ease, is just a conversation away. The length of time that it takes public authorities to answer an FOI request is one of the most common complaints about FOI. A quick glance at the decision notices relating to timeliness of responses on the ICO website is enough to confirm this. And sometimes requesters make a point of stressing in their request that they should receive a response within 20 working days. Sometimes they go even further. They remind us that they should receive a response “promptly”. In FOI, section 10(1) requires that a response is sent out “promptly, and in any case within 20 working days”. The EIR equivalent at regulation 5(2) calls for a response “as soon as possible and no later than 20 working days” after the request was received. So what exactly does “promptly” or “as soon as possible” mean? Well, as I explained in a post last year, the Information Commissioner does accept that public authorities have to balance their responsibilities. So it doesn’t mean that everything else will be dropped to answer your request. Depending on how the authority manages requests, and for instance, how many requests they receive, there could be lots of responsibilities to balance. Even the people directly responsible for answering FOI requests – people like me – can have quite a few things to juggle. A few months ago I featured a guest post here, where another FOI Officer highlighted the struggle they had to keep on top of FOI requests at a time of diminishing resources. And whilst I can’t claim to be struggling quite as much with my FOI workload (touch wood), I have a range of other responsibilities. As well as FOI, I am also responsible for, in no particular order – compliance with the Data Protection Act, Privacy and Electronic Communications Regulations and copyright licensing requirements, records management, student complaints and student disciplinaries. Oh, and the official archives. I’m not complaining – variety is the spice of life, so they say. But perhaps you can see why it might take us longer than you feel it should to answer even the simplest requests. Sometimes they just have to form an orderly queue. FOI Man looks at what a recent survey of FOI Officers for the Ministry of Justice says about practitioners’ views of FOI. This blog is all about FOI from the perspective of an FOI Officer, so an appendix to the Ministry of Justice’s recent memorandum to the Justice Select Committee caught my eye. Not least because MoJ’s conclusions in the memorandum appear to be so greatly influenced by the views of the practitioners quoted in it. A survey was carried out by Ipsos Mori for MoJ by telephone between October and November last year. 22 FOI Officers (or similar) in 16 organisations were interviewed and asked their views about FOI. We are not told which organisations were involved, but a table in the report indicates that 4 respondents were in Central Government, 5 in local authorities, 6 in health organisations, 3 in the Police, 2 in “commercial organisations”, and 2 in “other public authorities”. Given the breadth of the public sector covered by FOI, some might question how representative this sample can be (especially given that some of these respondents worked for the same organisation). “It’s very easy for people to make requests to us, because all you have to do now is use WhatDoTheyKnow.com. At least [before] they’d have to type an email or write a letter to us. Now all they do is put their information in and it sends it directly to us. I don’t think that’s a bad thing, I just think that it’s made it easier and made people lazier. For example, as soon as we refuse a request from WhatDoTheyKnow.com quite often we’ll receive a request for an internal review very quickly because all they need to do is push a button to say I want this to go to internal review”. WDTK probably has contributed to rising request volumes – fair enough. It does make making requests easier. But let’s be clear – THAT’S A GOOD THING. And just because something is easier, I don’t quite see how that makes people lazier. Requests from journalists and commercial companies are perceived to be a “drain on resources”. These kind of statements always frustrate me. It’s not unreasonable to note that volumes of FOI requests are rising. Or that this has had an impact on resources, especially during a time of economic difficulties. And, as unpopular as it may be with journalists, I also have no problem with public authority press officers being given advance warning of disclosures to the media. We have a right to defend ourselves and there is a public interest in public authorities doing so in my view. BUT it is not reasonable, in my opinion, for criticism to be levelled at broad categories of requesters. The whole point of FOI is that anyone can make a request. It doesn’t matter why they want the information, they have that right. If you believe in a democratic society, where everyone has rights, surely that makes sense and is to be welcomed. Moreover, the specific groups mentioned seem to me the very groups that we should be welcoming requests from. It is an amazing thing – not to be sniffed at – that any individual can ask searching questions of the government or their local authority or police force. But arguably requests from individuals don’t make that much difference – responses satisfy their curiosity but have very little wider impact. Responses to the media, in contrast, regularly get reported – you can hardly pick up a paper these days or read a website without seeing a reference to FOI – reaching a far wider audience, and having a much greater impact. Answering these requests is far more “cost effective” if you want to look at FOI that way (which I personally don’t, but each to their own). Similarly, those commercial organisations that are complained about – the general complaint is that they pick the fruits of publicly-funded work to make money out of it themselves – well, frankly that’s government policy. We’re supposed to be doing all we can to support our economy. And if the disclosure would really affect commercial interests, there is an exemption for that. A rather confusing paragraph in the report suggests that all respondents disagreed with the idea of the public paying for information, before adding that some felt that a nominal charge should be introduced to deter vexatious requesters. I’ll be coming back to this issue of cost in a later post. Most respondents were able to see that FOI had benefitted both the public and their own organisation to some extent or another. For the public, this was seen in increased transparency and engagement (though the report authors point to UCL Constitution Unit research questioning this latter). For the organisations, there were seen to be benefits of improved standards and professionalism and raised awareness of responsibilities to the public (which do seem to me to be very valuable benefits, though difficult to quantify). Few respondents were able to point to examples of FOI saving money in their organisations, but how about this one for starters). It’s no great surprise that many FOI Officers are concerned about falling resources and rising request volumes. 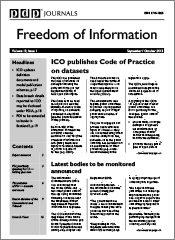 A few months ago I hosted a guest post here which vividly illustrated how difficult it can be to manage FOI requests in the current environment. But it really does concern me that so many of my colleagues – if this survey is to be believed – have such negative views of the legislation that they are responsible for implementing. If we’re to be effective in our jobs, surely we have to be able to champion FOI – to believe in its value to our organisations, to the public and to society as a whole. FOI can be hard work – and we all grumble at times (some of us publicly) – but we have to keep in mind the bigger picture.